This page will discuss some of the common upgrades and accessories for the Beretta model 92. 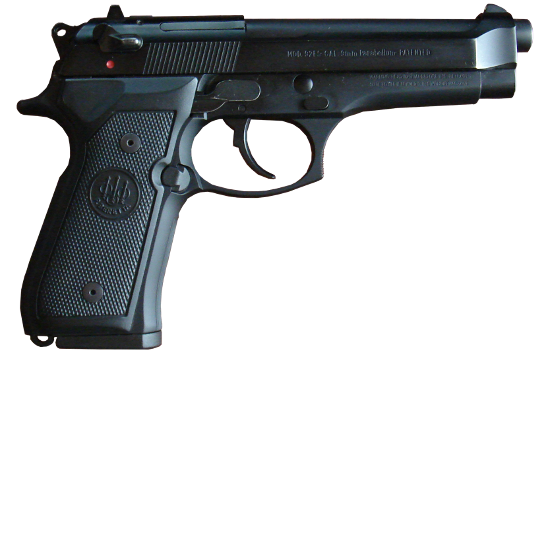 Click the button to see the appearance of the Beretta 92FS with the magazine inserted. When a Beretta model 92 is purchased, it usually comes with either a 15 round magazine or 10 round magazine. The 15 round magazines have a witness hole at 5, 10, and 15 rounds. The ten round magazines have a witness hole at 4, 7, and 10 rounds. Some versions are now shipping with 17 round magazines, such as the 90-TWO. The military standard issue magazine for the M9 is a 15 round magazine. The standard factory 15 round magazine or limited capacity 10 round magazines are of the same length. The limited capacity magazines are common because during the 1994 Assault Weapons Ban the standard capacity magazines were forbidden to sell within the United States, and even after the ban was lifted in 2004, certain states in the United States, including California, continued to limit capacity to 10 rounds. Beretta's solution to limiting the capacity of the magazines involves an indentation on the side of the magazines which prevents the normal number of rounds from fitting within the magazine tube. Other manufacturers have used different techniques to limit the capacity of magazine. These magazines generally have the marking PB on the magazine body and may also have the PB marking on the base plate. PB stands for Pietro Beretta. Both plastic and metal base plates exist. Beretta has marketed increased capacity magazines for a long time. There are factory manufactured 20 round magazines which extend further below the gun than the standard magazines. Also, more recently, factory 30 round magazines have been sold. These stick out even further. The factory 30 round magazines were especially intended for the MX4 submachinegun, which is in use by the Indian government. I have one of these magazines. So far, reliability has been perfect, but my magazine has only worked with 29 rounds loaded into it. Using a MagLula magazine loader, the first 29 rounds can be pushed in, but the 30th round is nearly impossible to get in. When I finally did get the thirtieth round into the magazine, the pressure required from the loader made a visible dent in the 30th round and the magazine would not fully seat into the gun with the slide closed. Perhaps through use of the magazine the springs will weaken to the point that the 30th round will fit in the magazine and allow the magazine to seat properly. 29 rounds in the magazine and one round in the chamber is still a nice capacity! The 30 round magazine sticks out to such an extent that it alters the gun's balance significantly and makes the gun unwieldy for carry in most holsters. But it would be a good magazine to use for a defensive gun that sits on a counter, or a good way to carry spare ammunition in a pouch. However, complete insertion into the magazine well when the slide is closed requires greater force than other magazines so if used as a reload without using sufficient force it could result in the magazine not being seated properly. The 30 round magazine has witness holes at 2, 4, 8, 12, 16, 20, and 30. On my magazine, I can see the 29th round in the 30th witness hole. The 30 round magazines are available both with and without the sleeve that extends the front strap striations. Only the 30th witness hole is visible when the magazine is inserted into the gun. There are also a number of after-market magazines manufactured by different companies. Magazines marked MDS, or Meccanica Del Sarca, are identical to Beretta marked magazines as MDS is the current OEM of the magazines for Beretta. In the past Mec-Gar used to be an OEM and some of the best magazines for the Beretta 92 are still made by Mec-Gar. These manufacturers of magazines are well reputed for reliability and I have personally had good reliability using these magazines as well. Check-mate Industries has been given large contracts to make magazines for the U.S. military. I have no experience with these magazines. Some have said these magazines worked well for them, but some have expressed concerns that they may not work as well as the factory manufactured magazines, which has caused some soldiers to seek to replace the issued magazines with Beretta factory produced magazines. There are a wide number of other companies that make magazines for the Beretta 92 as well. I've picked up from gun shows a few unmarked magazines. One magazine is a flush fit 17 round magazine without witness holes that has always given complete reliability. Another magazine was an unmarked extended 30+ round magazine, which, despite sticking out several inches below the gun, I could not even get 15 rounds into. The magazine also was very unreliable. There are magazines produced by "Eagle" that have a poor reputation, but I have not knowingly used a magazine from that manufacturer to determine if the rumors are justified. Mitchell's MFG also makes a 20 round magazine that they claim to be flush-fit. I also have not tried that magazine, but from pictures, it appears that the magazine is not actually flush fit and sticks out about the same amount as the Mec-Gar 20 round magazine. My favorite magazines are by far the magazines produced by Mec-Gar. Their anti-friction coating is excellent and the mags slide in and out with great ease. Also, the magazines hold more rounds than the standard magazines for the same sized magazine. For the same size as the factory standard 15 round magazine, Mec-Gar sells a magazine that holds 18 rounds. This is a great magazine for carry as it does not increase the size of the gun and allows for the greatest capacity. These magazines have 18 witness holes. These magazines are marked MEC-GAR DESIGN & MFG. The 20 round magazines made by Mec-Gar are my favorite magazines for whenever concealment is not a major concern. Despite holding the same number of rounds, the magazines are shorter than the 20 round magazines made by Beretta, and as a result are much nicer to carry. The extended length adds additional gripping surface without adding too much length. At the range, this also makes it easier to remove the magazine from the gun without dropping them, when compared to the standard flush fit magazines. They also slide into the gun with much greater ease than the Beretta factory 30 round magazine, so may be better for use as a reload. They are short enough that they still fit in many magazine pouches that are designed for typical handgun magazines. For concealed carry, the extra length of the magazine can make the gun noticeably more difficult to conceal, but for open carry or home defense, or use as a reload, it is a great magazine. I believe the magazine body is identical to the 18 round magazines. There are 18 witness holes, from 1 to 18. The only difference I can discern between the 18 round magazine and the 20 round magazine is that a "Plus 2" base plate is used on the 20 round magazine. These baseplates are marked "PLUS 2" on the side and "MEC-GAR" on the bottom. I believe it is possible to get the baseplates separately and thus convert an 18 round Mec-Gar magazine into a 20 round magazine, and vice versa. The Beretta model 96 is essentially the same gun as the model 92, except chambered in .40 S&W instead of 9mm Luger. The magazines are nearly identical. There are some minor differences, such as the feed lip angles. However, many people have reported that they have put 9mm cartridges into the 96 magazine in the model 92 and the gun functioned properly. For instance, some have reported that they can fit 14 rounds of 9mm Luger into a 10 round Beretta 96 magazine. In areas where the magazine capacity is limited by law to 10 rounds, some have used the 10 round Beretta 96 magazines as a work-around to increase the capacity of their 9mm model 92. However, the legality of this depends on the specific wording of the law. In some states, any modification of the model 96 magazine, such as modifying the feed lip angles, may constitute the manufacture of a prohibited magazine. Reliability may suffer when using 9mm in a .40 magazine and especially when using .40 in a 9mm magazine. However, some have reported few reliability issues. There are a number of different approaches to increasing the accuracy of the model 92. One of the most common upgrades is to get a new precision barrel, such as the one made by Bar-Sto or KKM. There are other barrel manufacturers out there as well. Generally, for best accuracy improvement, it is recommended to have the barrel be custom fit to the gun rather than going for a drop-in barrel. Unlike many popular pistols that feature a barrel bushing at the muzzle, the Beretta 92 barrel does not contact the slide at the muzzle end. Some special versions of the 92, such as the 92 Combat and the 92 Stock feature a barrel bushing from the factory. But these guns are harder to find and there are other options for barrel bushings. The Army Marksmanship Unit (AMU) upgraded their M9 to use the Weigand Nosepiece. Also, WAL, a member at berettaforum.net, sells a conical bushing that is highly regarded. Installing a barrel bushing generally requires threading the barrel and a special tool is used to remove the bushing. If one wishes to use both a bushing and a match barrel, it is important to get the barrel first because the bushing is fit to the barrel. The Army Marksman Unit M9 was made more accurate by reducing tolerances in the fit between the slide, barrel, and frame. Apparently, the aluminum frame posed a challenge in obtaining good slide to frame fit, so the AMU removed some of the aluminum from the rails on the frame and installed steel blocks. Another important factor is the ammunition used. In addition to the quality of the ammunition, one should check the inner diameter of their barrel and match the bullet diameter to it. It is common for Beretta 92 barrels to accommodate bullets slightly larger in diameter than the ammunition that is typically sold commercially. There are a number of different ways to compensate a Beretta 92. There are aftermarket barrels available that are longer in length and ported, such as the EFK Fire Dragon Barrel. Also, there are compensator units such as the SGS compensator that attaches to the front of the gun. The original SGS compensator may be hard to find, but HEC and others make a similar style compensator. Other styles of compensators exist also. TJS custom gun works offers a compensator but I have not seen one of these in use. One of the most popular and least expensive upgrades for the 92FS is to replace the F Hammer Spring with the D Hammer Spring. On the 92F, the heavy double action trigger pull is often difficult for many people to master. The D Hammer Spring is the spring that the Beretta 92D comes with originally, and offers a lighter trigger pull in both double action and single action. Since the 92D comes with this spring by default, this provides assurance that changing this one part is unlikely to result in light primer strikes. I have also heard of people using a 1911 hammer spring in the Beretta 92, but I do not know enough about doing this to know how well this works. Combining reduced power hammer springs with modified hammers and other parts may cause light strikes, especially with harder primers. One method of improving the trigger pull of a gun is with a trigger job. The more recently produced guns from Beretta use a thin metal trigger surrounded by polymer. For those seeking a trigger job, they will generally need to replace the polymer trigger with a steel trigger. A steel trigger can be polished and reshaped to improve the smoothness of the trigger pull. Also, many will opt for a different style trigger spring and this will also often necessitate the use of a steel trigger. Replacing the polymer trigger with a steel trigger can provide some advantage in itself as well. The metal trigger is generally smoother in texture, whereas the polymer trigger can have some rough edges from molding. Also, some claim that the increased rigidity of the trigger improves their ability to use it because the polymer trigger flexes while it is being pulled. While I prefer the metal trigger due to the feel and aesthetics, I never personally noticed much flexing of the polymer trigger. One potential disadvantage of the metal trigger is the increased heat conductivity of steel. If the gun is left in a very hot or cold place, the metal will transfer heat between your finger and the trigger very rapidly and be unpleasant against a bare finger. One way to get a steel trigger is to buy the kit from BerettaUSA's website that has a steel trigger, a trigger spring, and the D-hammer spring. You can often find good deals during sales. Also, Wilson Combat offers a short reach metal trigger. Over time, springs can wear out. It is recommended to replace springs from time to time to prevent the springs from breaking or excessively weakening. Also, by varying spring strength, the gun can be tuned to the preferences of the user. Many people choose to use aftermarket springs to replace the original springs. There are multiple companies to buy springs from. Wolff is one company that many choose to get springs from and they offer some different weight springs. The trigger bar spring is one spring that may break. If this spring breaks, the trigger will not automatically reset after firing, but the gun will continue to work so long as the trigger is pushed forward manually between each shot. The recoil spring may also weaken over time. This spring is responsible for returning the slide forward. Heavier recoil springs will help mitigate the battering of the frame to some extent, while weaker springs will help the firearm cycle when firing lighter loads. The hammer spring must be strong enough to ensure that the primer is hit with enough force to set it off. However, the stronger the hammer spring is, the more effort will be required to pull the trigger. The hammer spring also must be overcome by the slide during recoil since the hammer is cocked under recoil. The hammer springs that come with the gun are generally strong enough to handle almost any primer the gun could come across. It is popular to replace the hammer spring that comes with the F model of the gun to use the D Hammer spring. This lightens the double action pull considerably without compromise in reliability with most ammunition. Brignoli has a lot of Beretta parts for sale. Also, parts can be obtained through Brownells, Allegheny Gun Works, Wilson CombatMidwest Gunworks, Beretta USA and other places. Rails are nice to have if you wish to attach a flashlight or laser, scope, or other accessories to a handgun. For the versions of the Beretta 92 that do not come with a rail, there are some solutions. There are rails that will attach to the trigger guard, but one must take care in selecting these rail mounts as the contours of both the trigger guard and the dust cover have changed over time. For example, current production Beretta 92 have a slanted profile to the dust cover in front of the trigger guard, whereas older versions had a straight profile. The slanted dust cover adds material to the frame to strengthen it. This change was made to strengthen the frame for the .40 S&W round, and kept the same on the 9mm versions to simplify production. In addition to rails that mount below the gun, there are also options for rails that will allow the mounting of sights and optics. There is the WOR4 Tac Rail that mounts to the front of the gun and creates a rail that goes over the top of the slide. There is also a fellow named jdm033056 on Berettaforum.net that sells a rail that replaces the rear sight on the top of the gun. The neat thing about his rail is that it also acts as a rear sight by itself when nothing is mounted to it. There are a few approaches to attaching a laser to a Beretta 92. Some versions of the 92 come with a rail or were modified to have a rail. Thus a rail mounted laser can be added. But probably the most popular option is the CTC Laser Grip. The advantage of this grip is that one does not need to move their hands from the grip to activate it. A disadvantage is that the CTC laser grip, by offsetting the laser horizontally, will be off both vertically and horizontally at all other distances than the distance it is zeroed at. Lasers mounted directly below, (or above), the barrel, if properly aligned, will always be aligned horizontally but will only be vertically aligned at one or two distances. (The parabolic trajectory of the projectile means that it may intersect the laser beam at two different distances.) Another option for mounting a laser to the 92 is using the Lasermax guide rod. It replaces the normal guide rod and also replaces the takedown lever with one that has a switch. Many people like to modify the sights on the Beretta 92, for instance by installing night sights or adjustable target sights. Replacing the rear sight on the Beretta 92 is relatively straight forward as it can be punched out, but most versions of the 92 have a front sight which is staked into place. There are some versions that have the front sight in a dovetail notch, and for those modifying the front sight is much easier. However, even without a dovetail front sight, it may still be possible to modify the sight or send in the slide to be modified to accept a new front sight. Night sights use tritium, (which is a radioactive chemical with a 12 year half-life that emits beta radiation) to excite phosphors and thus glow in the dark without requiring any battery. Trijicon is a popular manufacturer of nightsights. There are also some people who opt to use glow in the dark paint or stickers on their existing sights or to get sights with a photoluminescent material built in. This is a cheaper option than a tritium night sight, but generally only provides visibility in the dark for a few minutes after exposure to a light source. Beretta sells an adjustable rear sight but there are other options to choose from as well. Many dislike the aesthetics of the plastic guide rod used in newer guns. One advantage of the plastic guide rod is that dropping it is less likely to deform it, and the plastic does not need to be lubricated. However, some will opt to purchase a steel guide rod from Beretta like the ones used in older versions of the Beretta 92. Wolff makes a steel guide rod, as well as other companies. One highly rated steel guide rod is the Steve Bedair Stainless Steel Guide Rod. Unfortunately, it does not appear that Steve is doing the work anymore. Steel guide rods can still be found directly from BerettaUSA's website and also from other sellers such as Wislon Combat, who offers a fluted guide rod. The steel guide rod increases weight, and some competition shooters like the increase weight. Recoil buffers and laser guiderods are also alternatives to traditional guiderods. Lasermax offers a pulsating laser that replaces the guide rod, in both red and green. There are replacement guide rods and devices that are designed primarily to reduce frame battering under recoil. The 90-TWO comes with a buffer installed from the factory, but there are other solutions such as the buffertech model. These may increase frame life but I have not seen tests that demonstrate how effective they are. Wilson Combat, Blackjack Buffers and SwissBianco also offer recoil buffers. It is common for people to want to replace the plastic parts in the newer versions of the 92 with metal parts. The plastic parts in the newer guns include the trigger, guide rod, safety lever, lanyard loop (which is also the hammer spring cap), the magazine release, the magazine base plates, and the grip panels. Because the newer stainless steel guns use black parts for the controls rather than stainless colored parts, this is another reason why some people change out these parts. The Beretta 92 is a popular platform for suppressor use. The Beretta 92 uses a locking system similar to the Walther P38, where the barrel moves straight back. For the purposes of suppressing a firearm, this is sometimes considered advantageous to the browning tilt mechanism. A suppressed Beretta 92 often works properly without a booster mechanism or changing recoil springs. (But changing these might help.) Because the Beretta 92 usually comes with a barrel that protrudes beyond the slide, the factory equipped barrel can be threaded to accept a suppressor. Alternatively, one can buy a threaded barrel to replace the factory barrel. Most of the parts between different variants of the 92 are interchangeable. The barrels of different Beretta 92 models are generally interchangeable and can be dropped in without modifications. This allows one to add a threaded barrel, put in a barrel with a different finish, or caliber. Caliber changes may not always be as simple as just changing the barrel, however. The extractor is different between the .40 S&W and 9mm Luger slides. Changing the gun from one caliber to another may sometimes be as simple as changing barrels, but for best reliability it is preferable to use a complete slide and the proper magazine for each caliber. Beretta 96 slides and barrels are in .40 S&W and Beretta 92 slides and barrels are in 9mm Luger. There have also been some .357 Sig barrels. The .357 Sig cartridge is derived from the .40 S&W cartridge, so the extractor, ejector, and magazines for the .40 S&W Beretta 96 will be a better match for this cartridge than the 9mm 92FS versions. 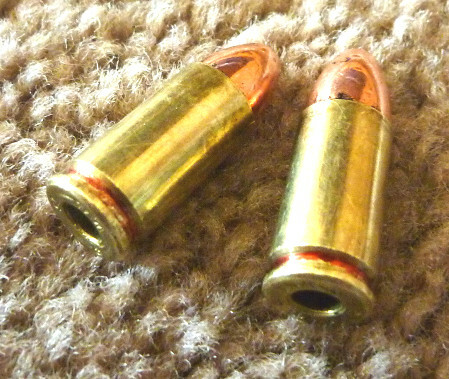 Some have had success using a 9mm 92 barrel in a 96 slide, but it does not work to use a .40 S&W 96 barrel in a 92 slide. The slides are also generally interchangeable. There is a major exception. The older frames on the 92F and previous models use a small hammer pin, whereas the later guns use an enlarged hammer pin. A 92F slide will not work on a 92FS frame without changing out the hammer pin or modifying the slide because the enlarged hammer pin will get in the way. By placing a Beretta 96 slide on a 92FS, or vice versa, one can convert the gun between .40 S&W and 9mm. The feed ramp and the ejector is slightly different on the frame between the 96 and the 92 but most have reported good reliability after changing the slides. There was a gun sold by Beretta in the past that came with both a .40 S&W and a 9mm Luger slide. This gun used the .40 caliber frame. Failures of the slide of early military guns resulted in the rear portion of the slide flying backwards towards the user. To address the military complaint, Beretta made the hammer pin larger which will prevent the slide from striking the user if the slide fails. It is possible to have Beretta upgrade your older gun to the new configuration. I also know there is at least one example of a Beretta 92 converted for use in 10mm Auto, but converting to that caliber may be more complicated. The 9mm version of the gun will have the longest service life. The .40 S&W model 96 has a shorter service life, and many feel that chambering the gun in .357 Sig makes the service life too short. It is likely that a 10mm version would have an even shorter service life. There are more grip options than can easily be listed. However, grips are one of the most commonly changed parts of the Beretta 92. Because the grip of the Beretta 92 is wide, many change grips to try and make the grip slimmer. Trausch is one manufacturer of grips that is reported to be thinner than the factory grips Some will also choose aluminum grips, which are made by Alumagrips and others. These may be thinner. Alternatively, some want more to grip. Hogue finger groove grips are a popular choice. CTC laser grips are also popular options. Some other common modifications to the Beretta 92 include extended magazine release buttons, and beveled magazine wells, and Jet Li resistant take down levers. An extended magazine release may allow some users to release the magazine more easily, and beveling the magazine well can make inserting magazines easier. After Jet Li disassembled an opponents Beretta 92 in the Lethal Weapon 4 Movie, many people worried that someone could do the same to them as well, so some takedown levers have been devised to make it more difficult to disassemble the gun. Last Updated June 26, 2015 to add the slide manipulation techniques section and more info on accessories.